If you could recall, i said earlier that Infinix Mobility will surely release Nougat update for the Infinix s2 Pro; and now, it's here. 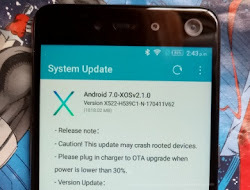 Infinix S2 Pro that came running on Android 6 Marshmallow has started receiving Android 7 Nougat update. If you are an S2 Pro user, you should get the update notification via OTA. The new software update is available via OTA (over the air), and it weighs in at around 1.8GB in size. You probably need to connect to a fast Wi-Fi network and also charge your battery to at least 80% before proceeding with the software update. Besides the benefits of Nougat, this software update brings other optimisations to the Infinix S2 Pro as well as fixes for minor bugs. Now that Nougat OS is available for the Infinix S2 Pro, i guess you should go get your own S2 Pro now, if Nougat was the reason you didn't bother buying the phone when it was newly launched. If you feel impatient, or can't wait for the update to arrive on your S2 Pro via OTA notification, then you should check for the update manually by heading over to your Handset's Settings menu > About Phone > System update. Infinix S2 Pro Android 7 Nougat update. Android 7 Nougat hits Infinix S2 Pro. Download Android 7 Nougat update for Infinix S2 Pro via OTA. Which phone is that? S2 Pro? Nice. But I think it was a bad idea for the phone not to be Nougat from the box. Makes no sense. Now, this will consume a big part of the memory. On the bright side, it has an update and so, we should just appreciate that.